One minute it’s July and the next it’s January – at least it is in my website world. 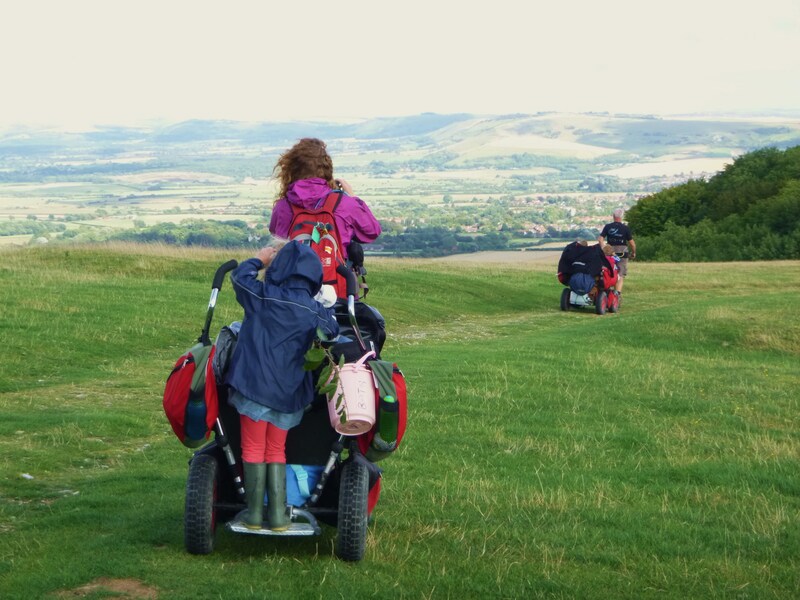 Sorry to take so long to report back on pram-pushing shenanigans along the South Downs Way. My excuse for such tardiness? Ill parents, ill children, ill-functioning computer, internet service that keeps going up the shoot in this neck of the woods (water in the line we keep being told – and yes, I’m still backwards – I’ve got no smartphone, i-phone, i-pod, i-pad, or ear-pads – actually I think I’ve got some of those – they keep my ears warm under my helmet. Nor have I ever twittered or tweeted or Facebooked – my fellow pram-pusher Dutch Anoek is my overseas Facebooking correspondent who kindly insists I need a Facebook page and does it for me with a small bit of trans-North Sea input from me. One day I’ll move with the times but for now I’m quite happy overworking my bottom bracket and digging holes in the garden. 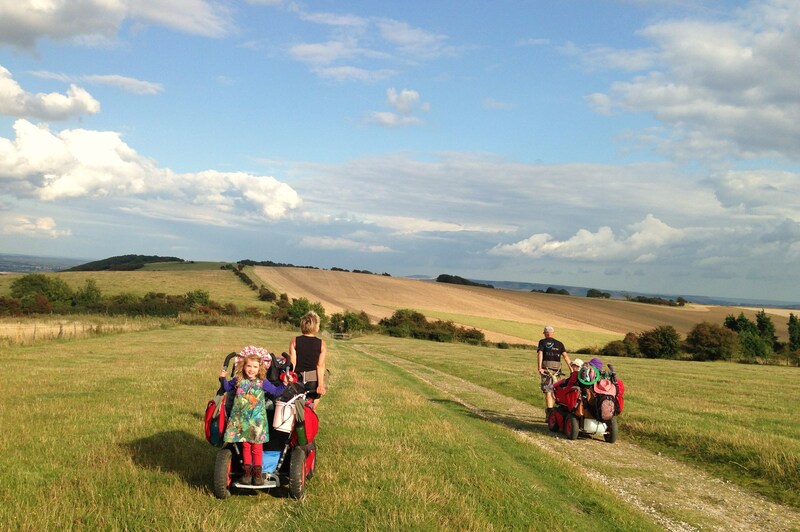 For the rest of the time my days are non-stop chasing after offspring and riding a wide and varied selection of bikes and trikes. 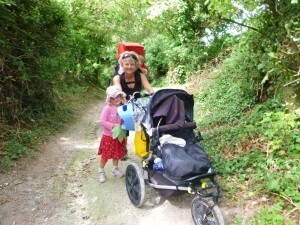 I also do a lot of pram-pushing. And nappy-changing. And cooking and cleaning and washing with a bit more nappy-changing on the side). 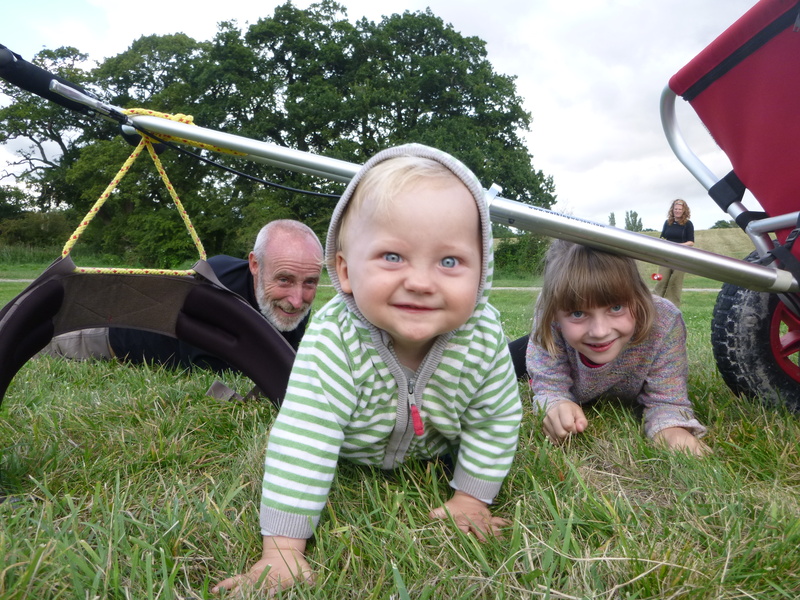 And so to Operation Pram Push, which is all done and dusted. From 1st August to 25th August 2014 I walked the 100-mile route of the South Downs Way (Winchester to Eastbourne) with Molly (7), Daisy (4) and Jack (11 months). 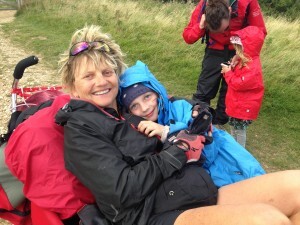 Although it wasn’t so much walking as pushing and pulling and hauling and heaving and slipping and sliding. This is because we were travelling with one Mountain Buggy pram and two spectacularly overloaded Dutch Walking Wagons (glorified sledges on wheelbarrow wheels). 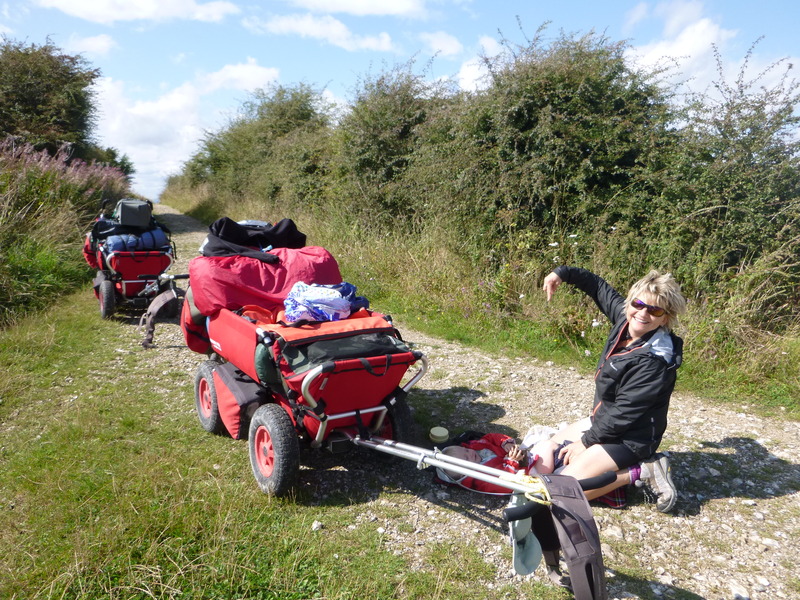 Helping me to push was my Dutch friend Anoek (11 years my junior) and her bearded juggling Dutch friend Guust – who we called Goose (throaty phlegmy Dutch pronunciation difficulties for us Anglo dwellers) and who was 10 years my senior. Anoek also brought her daughter Mila (4). Day 1! The start of Operation Pram Push. 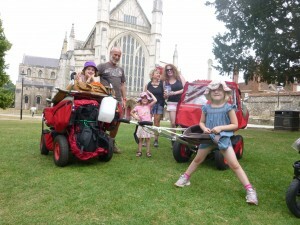 Winchester Cathedral with loaded wagons. 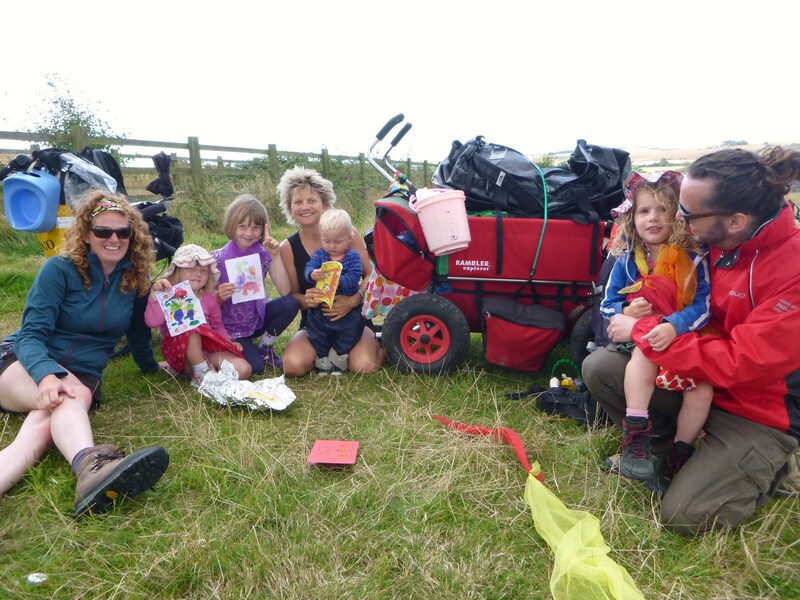 Wagon-pushing team from left to right: Molly,Goose,Mila, me with Jack on back, Anoek and Daisy Dew. Weather: medium sunny. Day 25! August Bank Holiday Monday. Eastbourne - the end of the South Downs Way. Holding aloft basketball medals that Goose had presented to us for surviving the wagon-push (Goose teaches basketball in Holland so thoughtfully and handily had concealed the medals about his person during the pramming voyage). Weather: cold and wild and windy torrential rain. Welcome to a typical British August Bank Holiday! Mila catching a lift on my wagon with Goose leading the way. Streat Hill - south-west of Plumpton, north-west of Lewes. 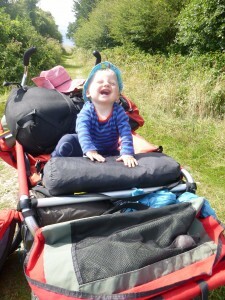 Happy hiking with Jack in backpack. Approaching Old Winchester Hill – east of Exton. On-the-road nappy-changing. One of many such stops! Camping beneath the pylons in a field west of Devil's Dyke, north-west of Brighton. 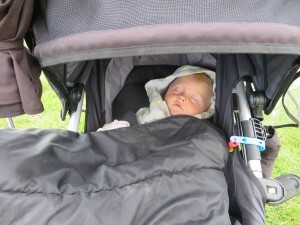 Daisy is ruminating by the pram and Jack is attacking the grass. 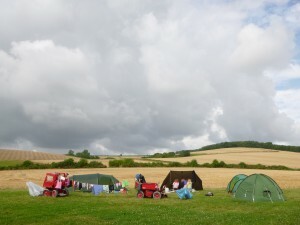 As there is only about two official campgrounds along the South Downs Way we just had to put up our tents where we could - beside the track, beside a field, beside a wood, on farms, in gardens, by rivers, under pylons. We asked permission wherever we could and where we couldn't we tried to be discreet in only the non-discreet way you can when travelling with bright red eye-catching wagons and loud chirruping children. 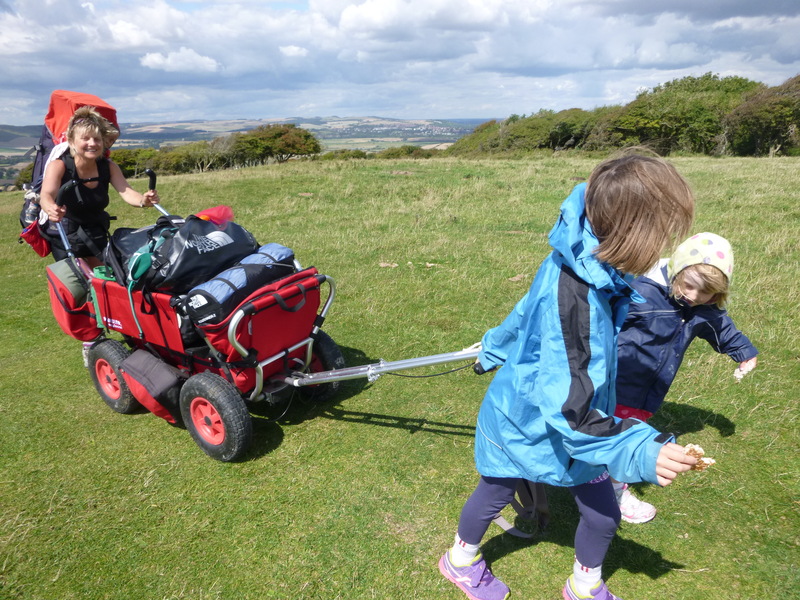 Helping Goose with heaving and hauling up Amberley Mount. 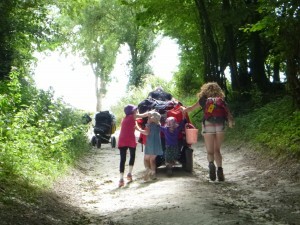 The wagons weighed as much as half a car. 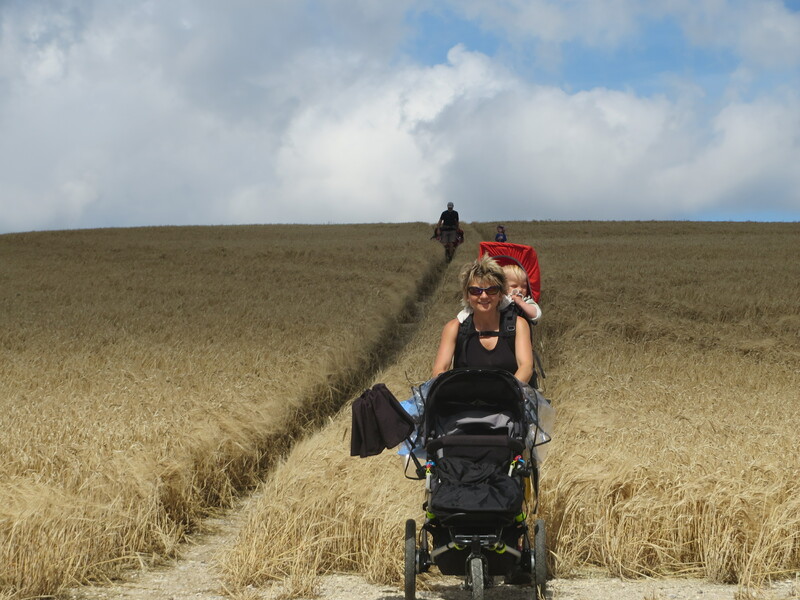 Emerging from a golden barley field (the South Downs Way cut a swathe right through it) on Littleton Down, south-east of Stickingspit Bottom and west of Bignor. 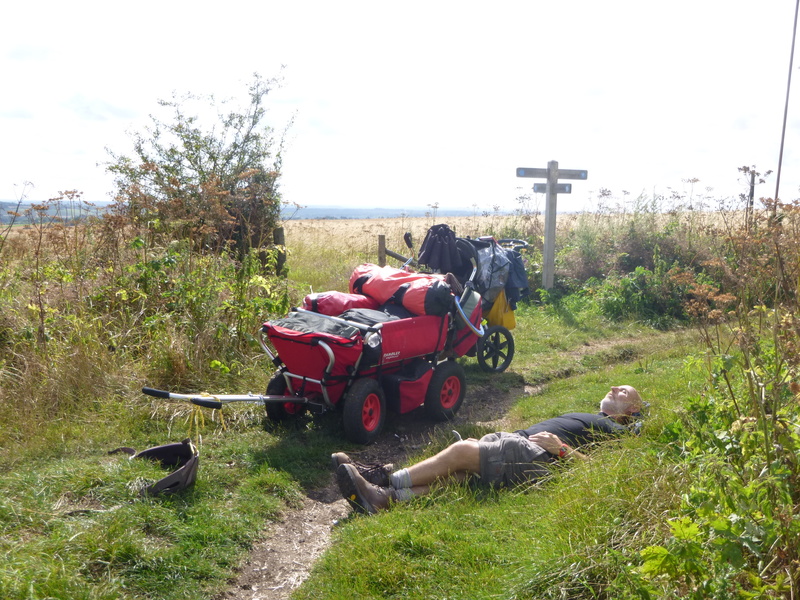 Lunchtime stop atop Stump Bottom Down, south-west of Kingston near Lewes.? It was constantly blowing a gale up on the Downs so sometimes we erected a tarp (using tent pegs and walking poles) to give brief respite from the wind. ( Molly is in the tarp with Pek (or Jesus as we called him - he looked like Jesus when he let his mane fly wild - Jesus is Anoek's sort of husband who joined us for the last 4 days). 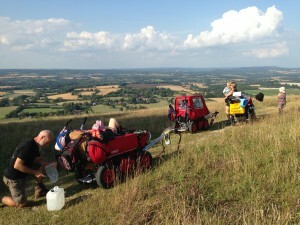 Chanctonbury Ring, south-east of Washington (no, not that one, this one). Taking a breather overlooking distant Brighton. 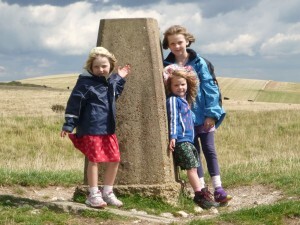 Daisy, Molly and Mila being wind-blown at one of the many trig points we were to pass. In just under four weeks Jack turned from squeaky clean baby to big grubby boy. 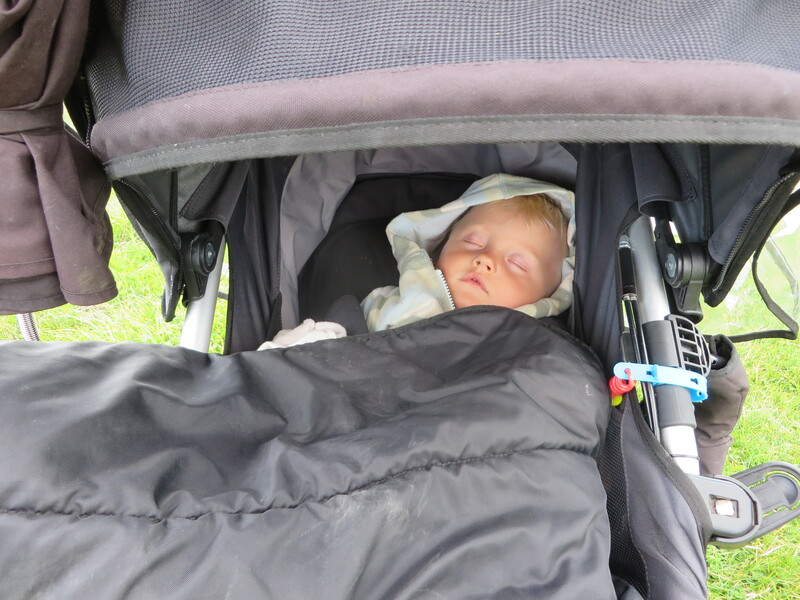 He sprouted two teeth (to add to his other two) and the minute we set foot on the Downs he learnt to crawl and to pull himself up to stand propped against the pram or a wagon or a farm gate (before we had left he had been quite content just with sitting and rolling). Jack was constantly filthy - as we all were. We found three showers in three weeks. For the rest of the time it was just a splattering of rationed water in a bucket and a half-hearted sluice. I washed clothes in a puddle of cold water or under farmers' outdoor taps. Feral Jack on the loose near the Devil's Dyke. 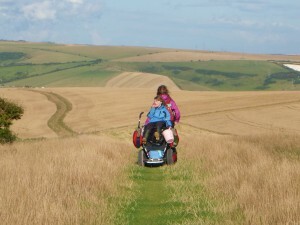 Molly and Daisy taking the strain: Itford Hill north of Newhaven. 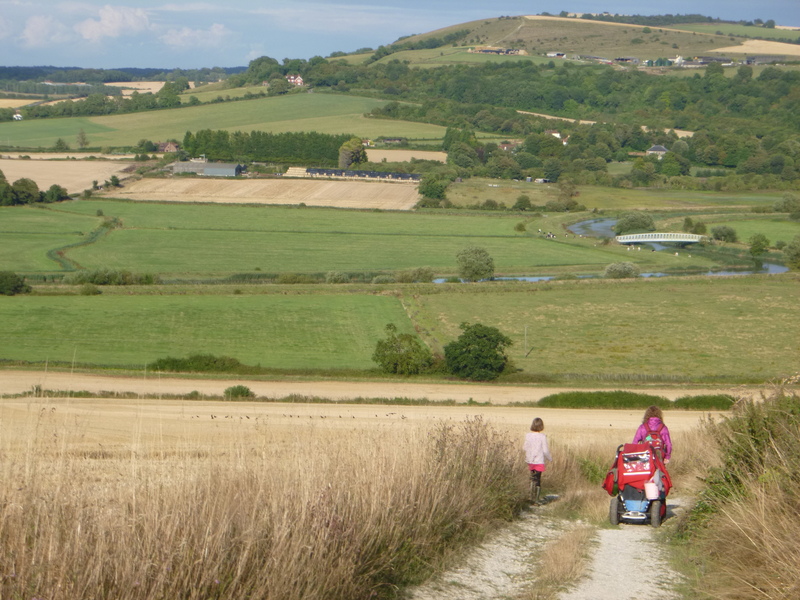 Windover Hill east of Alfriston. Jesus bringing up the rear on Bostal Hill east of Bostal Bottom with first sighting of the Seven Sisters. 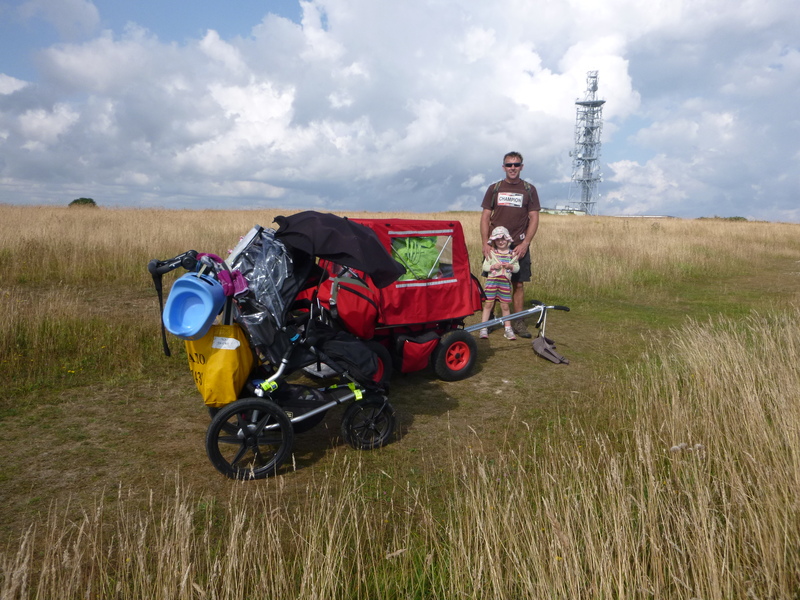 What better view to breastfeed a babe than on top of Harting Down - at least that was what I had been doing seconds before this picture was taken!. 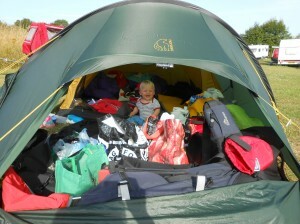 Jack in inner tent among a cascading sea of clobber. 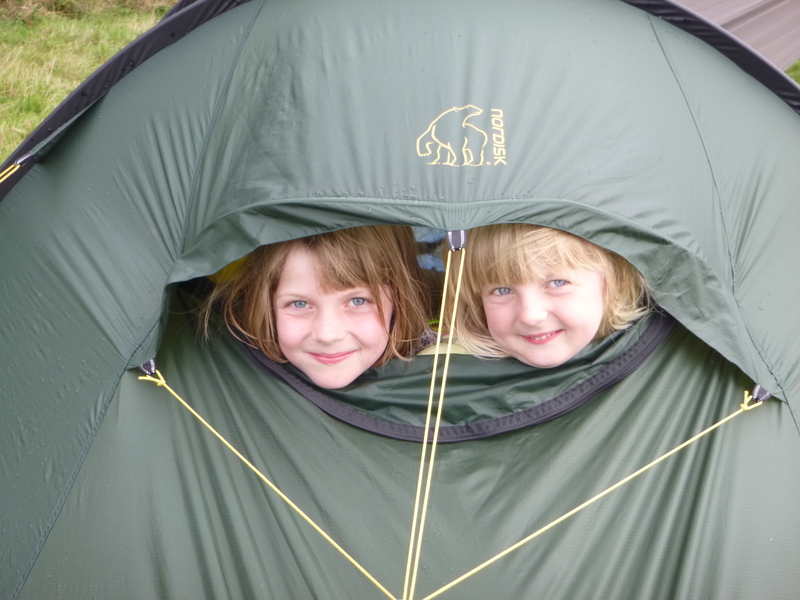 I slept in my Norwegian Nordisk Oppland tent with Molly and Daisy and Jack squeezed in tight around me, which left no space to stretch or manoeuvre (I would wake in the night with Molly's arm flopped across my neck like a noose, Daisy's head on my legs and Jack rolled into a foetal ball in the crook of my stomach). Anoek and Mila slept together in their tent while Goose lounged luxuriously in his alone. As Goose was predisposed to some shockingly thunderous snoring, we made sure he set up camp well out of earshot. 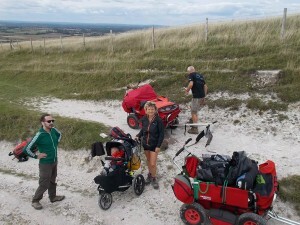 The South Downs Way ahoy! More heaving and hoing up Itford Hill east of Southease and north of Newhaven. More pushing up a Down - this one the one out of Alfriston. 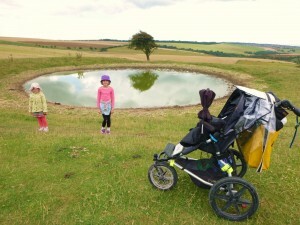 A dew pond! 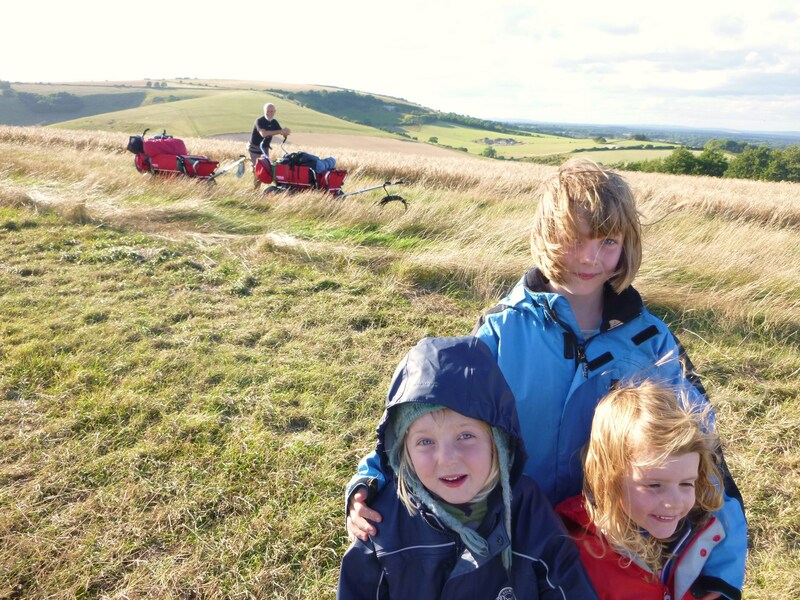 West of Ditchling Beacon. Jack's first birthday: field near the River Ouse. Daisy, Molly and Mila with a distant Goose: Winding Bottom Down south of Steyning. 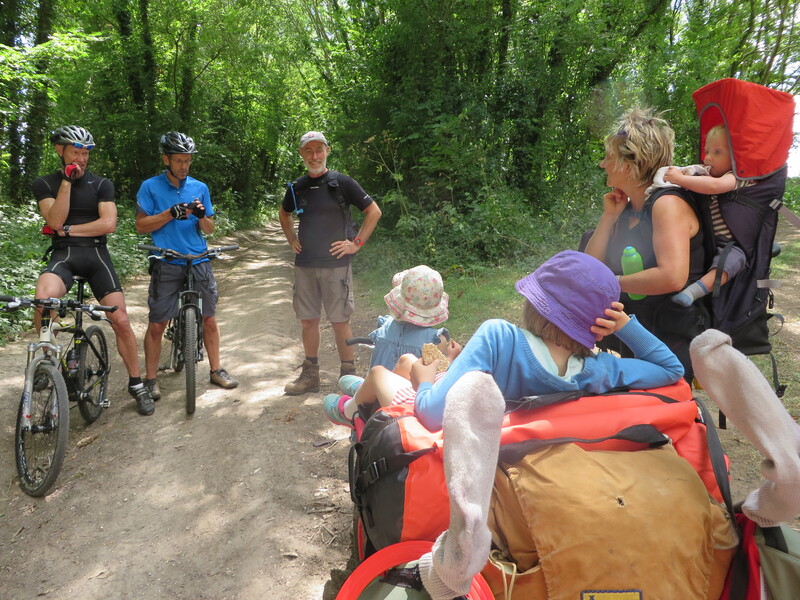 Gary met up with us twice on the route - both times bearing emergency supplies of food and nappies and books for molly (she's a dedicated bookworm). 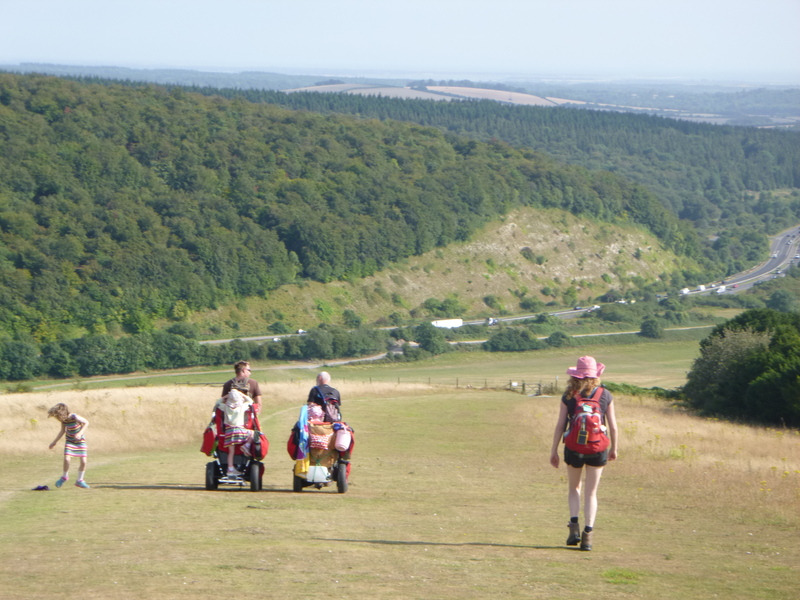 This is rendez-vous point number 1: Butser Hill , which at 270m is the highest point on the South Downs Way and home to over 30 species of butterflies - which might be of interest if any of you happen to be butterfly boffins. 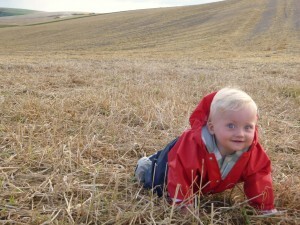 Jack making a break for freedom: Cheesefoot Head, east of Winchester. 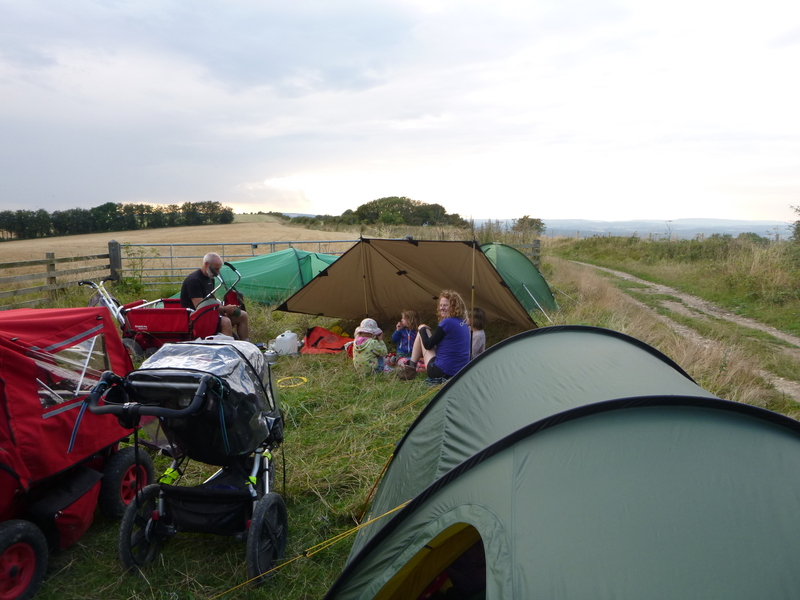 Camping in field near the River Arun. 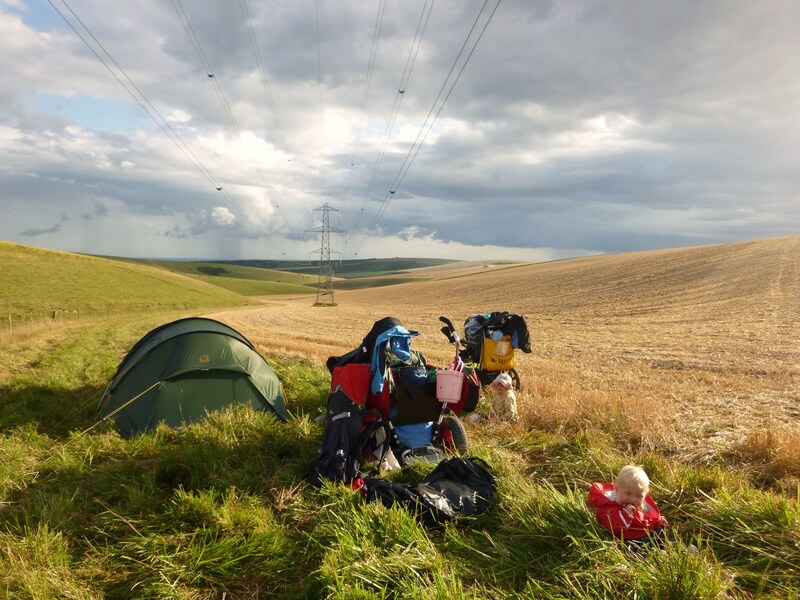 More pylons and potties: Fulking Hill, west of Devil's Dyke. 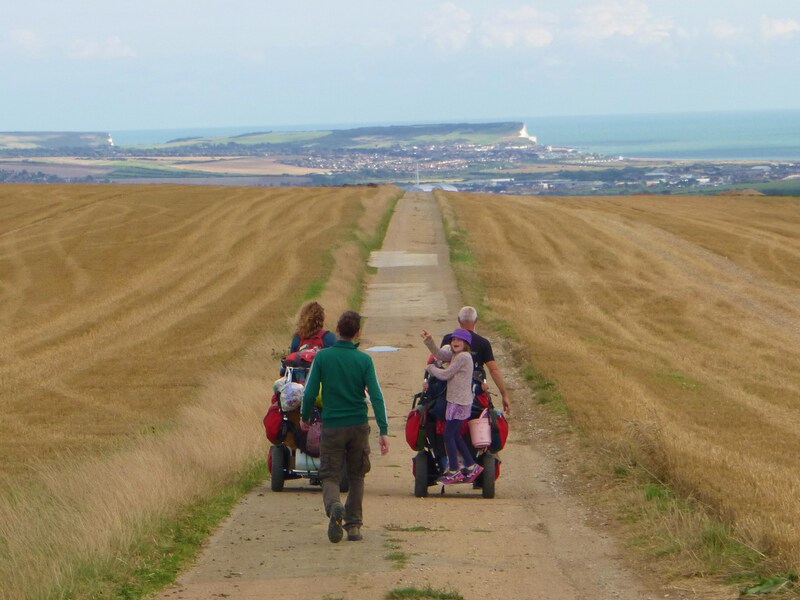 Walking down Butser Hill towards the A3 and Queen Elizabeth Country Park with the Solent and Isle of Wight in the distance. 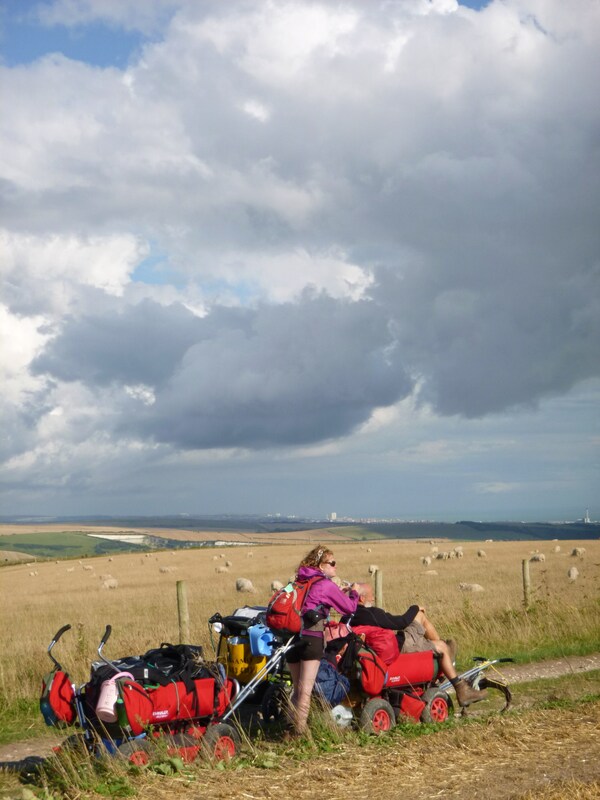 Molly east of Ditchling Beacon, north of Brighton. Bramshott Bottom west of Beacon Hill, south-east of South Harting. Despite being August the Downs were fantastically empty. Every now and then we would meet the odd walker or hiker. 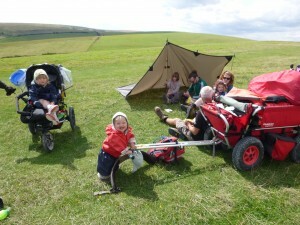 Nearly everyone we met was very confused, bemused and baffled with our set-up. You could see them thinking: what is a man who looks like Moses doing travelling with two younger women, a small herd of girls and a baby? It was all most amusing. For most of the trip Anoek became my wife which only added to the confusion. Especially to the more elderly conservative dog-walkers of this land. People would stop us and take pictures of our travelling circus of wagons. One person said we looked like refugees. Another said we looked like gypsies. Some said we looked biblical. One thought we had stepped straight out of an Enid Blyton Famous Five adventure story. Most thought we were insane and most were astonished we were doing what we were doing. 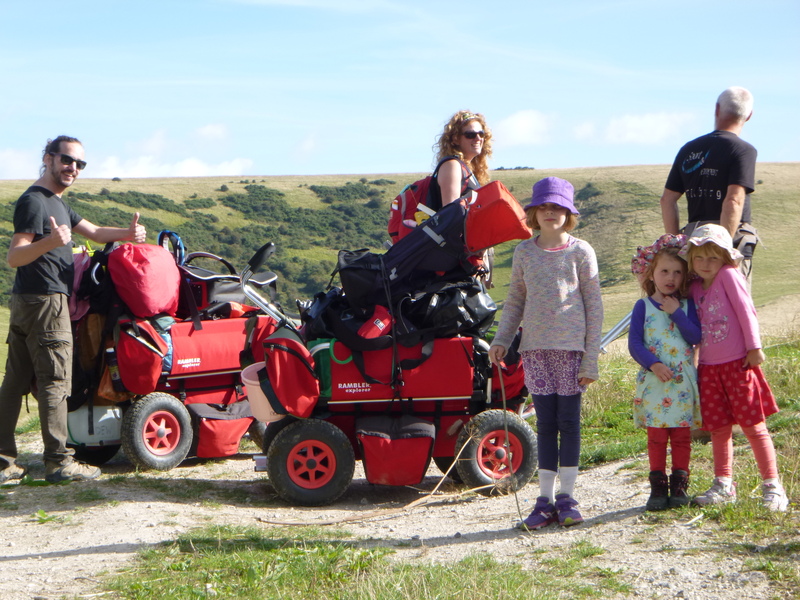 Groups of big grown men on mountain bikes would screech to a halt and exclaim: 'You're going to drag all THAT all the way to Eastbourne?' 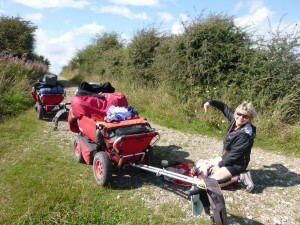 Most asked if the wagons were power-assisted by was of a battery or a lawn-mower-type engine (unfortunately not). 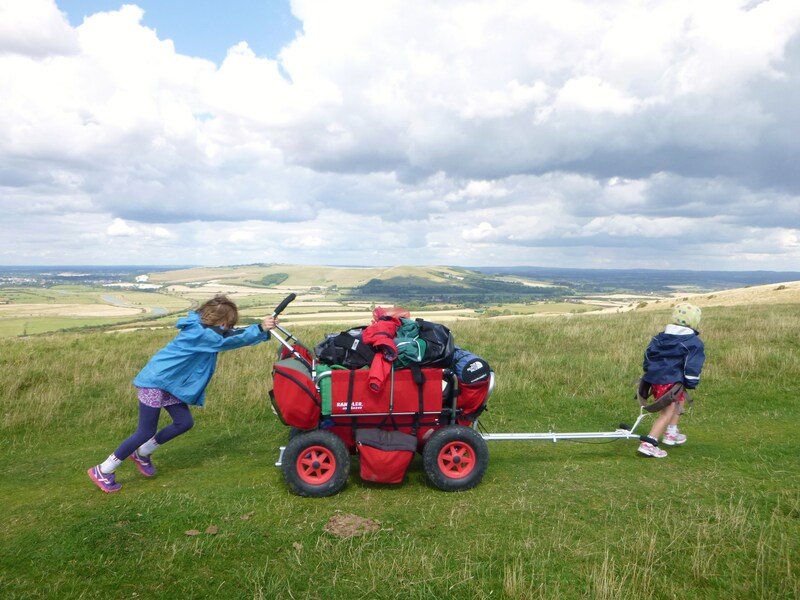 A number of passing hikers wanted to have a go at pushing or pulling a wagon - and then they would give up after a foot, dumfounded by the ridiculous weight. 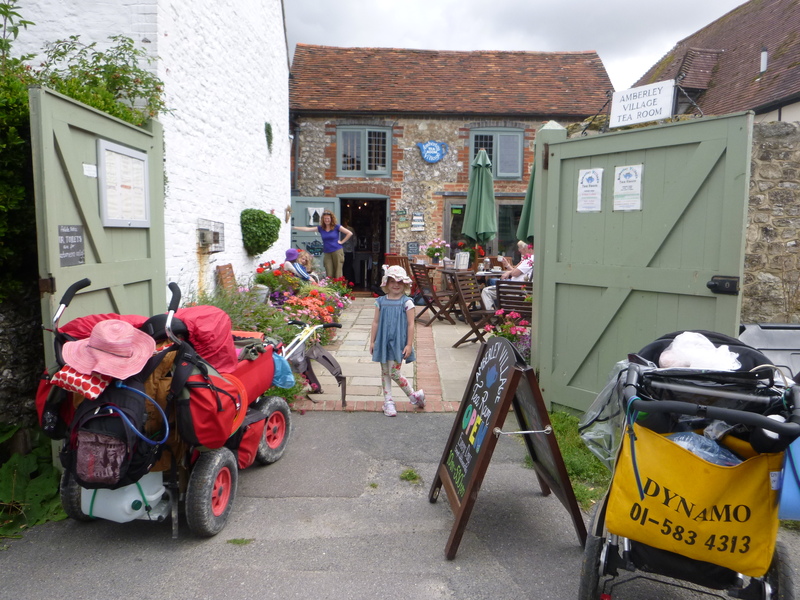 One passing backpacker said, 'The way you move is like from ancient times, like when they brought the rocks to Stonehenge.' Most people couldn't understand why we were doing the trip. The distance! The hills! The weight! And with all those children and all that heavy clobber. All that dragging and towing. The lack of facilities. The difficulty with finding food and water. All that discomfort and dirt and effort. And with a baby! Why? Why? 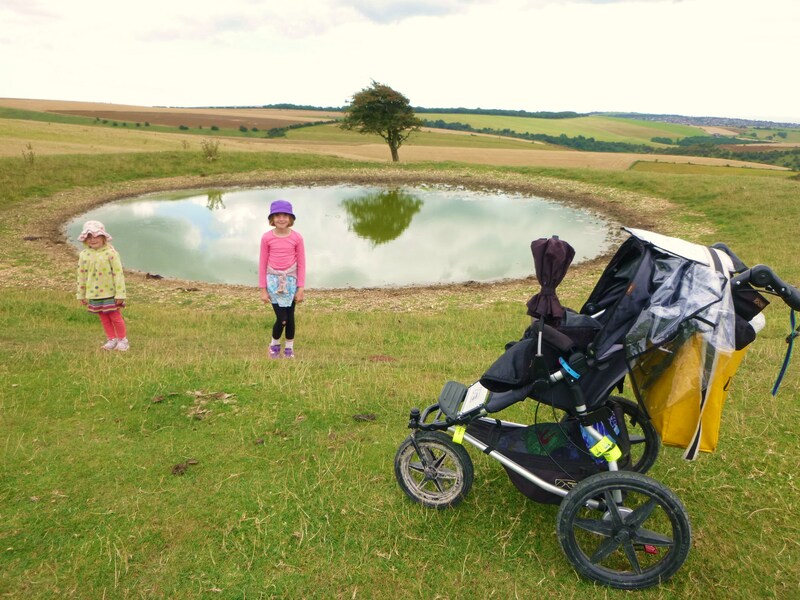 Because it’s fantastic to travel with your children so slowly and laboriously through such a beautiful landscape and not know what might happen. The sense of uncertainty and unpredictability of doing something that felt at times so impossibly ridiculous, and the pain and effort of dragging and pushing such loads intensified every sight and sound and smell. 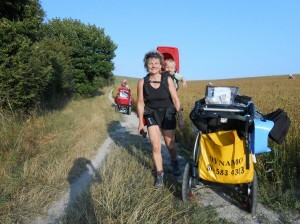 Hauling and heaving a ton of kit over hill and Down at the speed of a snail in labour while all the time not knowing where we might sleep or who we might meet or where we might find food or water sent all senses into overdrive. 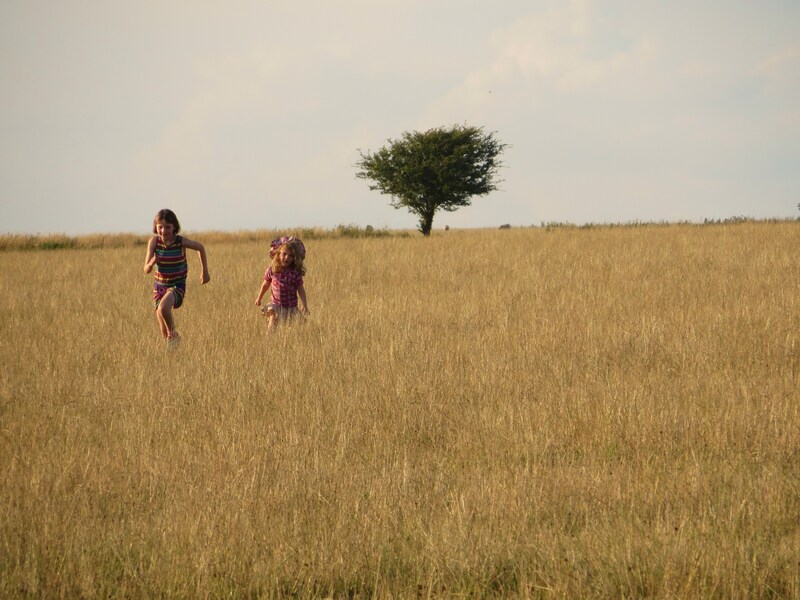 Molly and MIla: in a sheep field where we camped up on Beacon Hill, east of Harting Down, west of Mount Sinai. Jack in happy yee-haa wagon-riding mode. 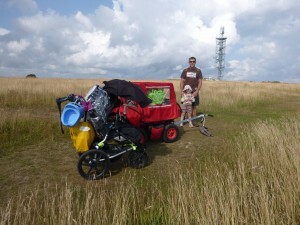 We've just walked down off a Down into Washington in search of food and water. Jack trying Goose's boots for size where we were camping in someone's back garden sandwiched between the busy A273 and A23 at Pyecombe, north of Brighton. Jesus, Anoek, Molly, Mila, Daisy and Goose atop Stump Bottom Down, south of Kingston near Lewes. 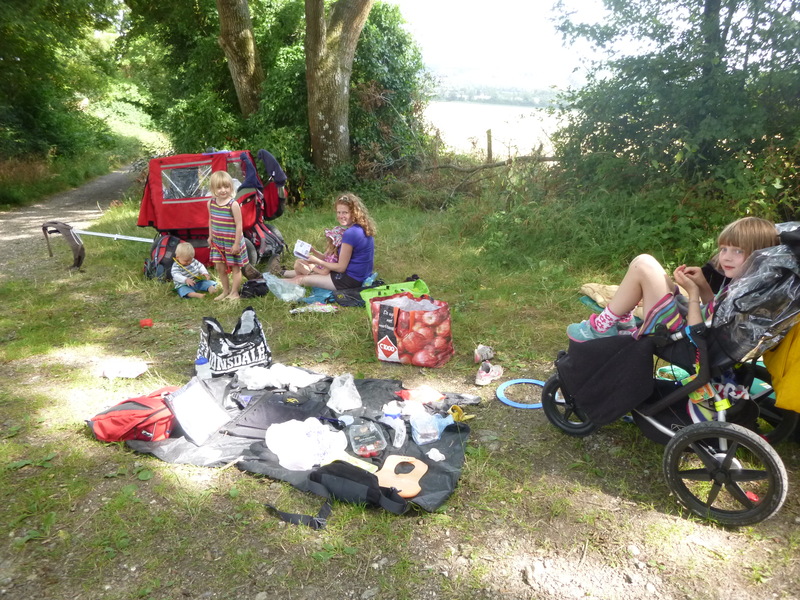 Picnic spot heading up onto Forty Acre Lane, south west of South Harting. A rare tea-shop-stop - in fact, our only one! 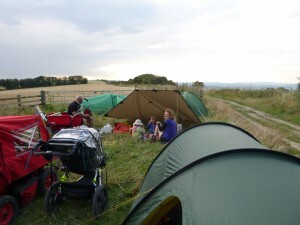 - Amberley, north of Arundel and Littlehampton. 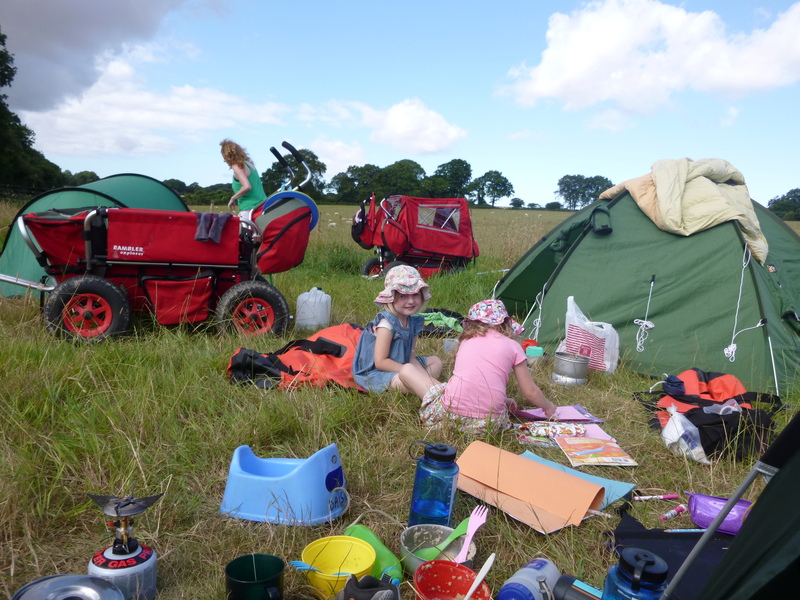 Track-side camping. 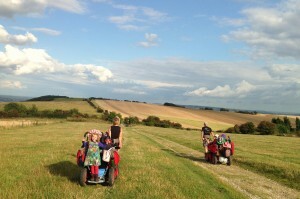 East of Amberley, south of Storrington. Daisy hitching a downhill ride. 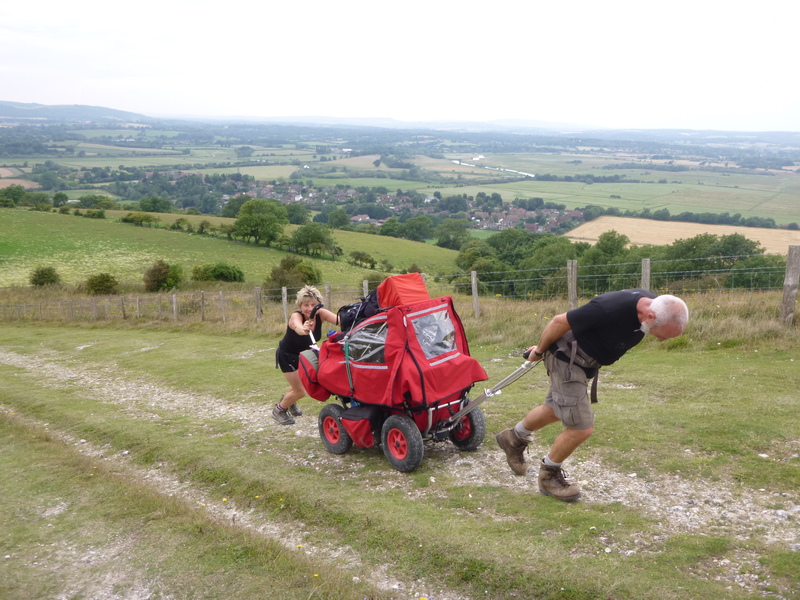 There was no hitching lifts uphill. 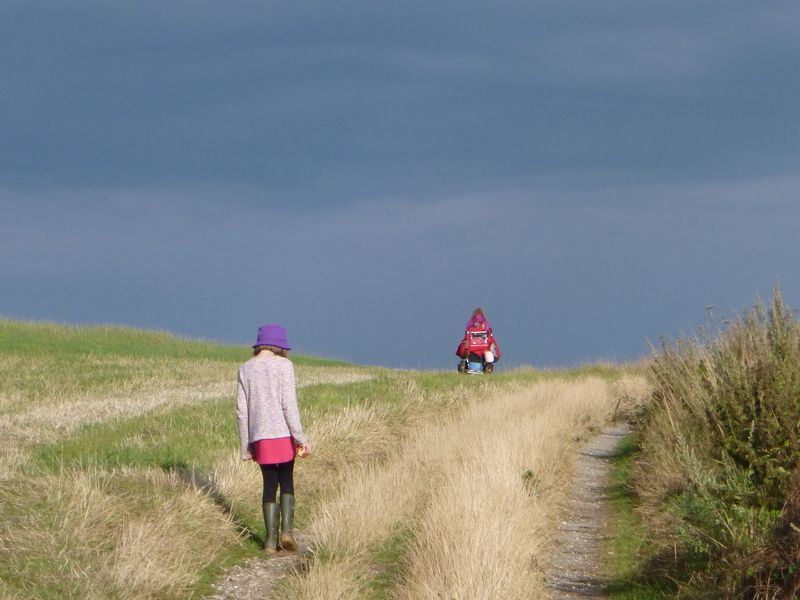 Molly walking into the storm. 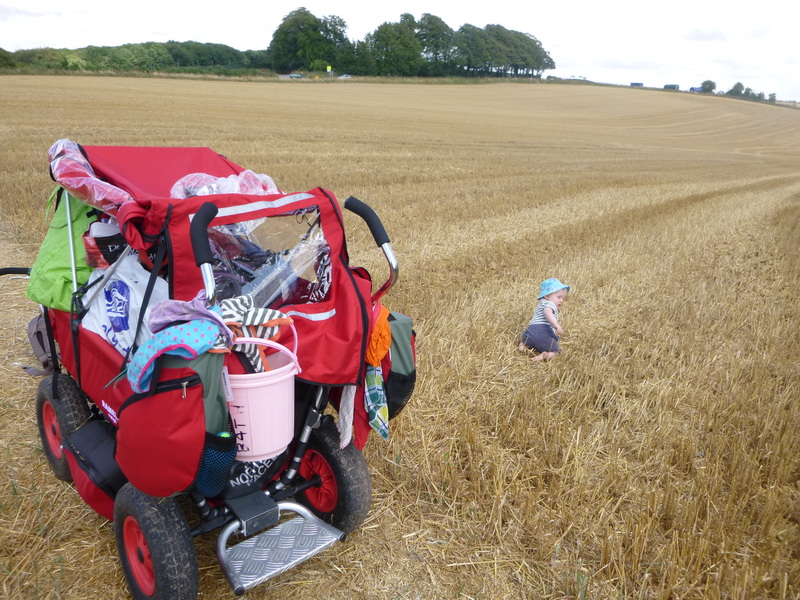 Having a breather with Molly - the wagons make good snuggle seats. 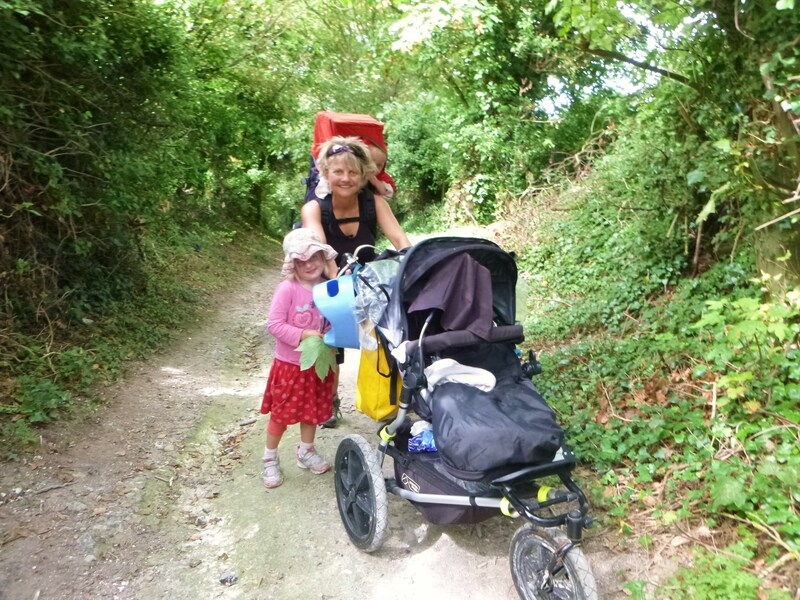 Molly and Anoek walking down Houghton Down towards Amberley. Molly jumping on board a wagon for a momentary ride across Annington Hill, north of Steep Down and south of Steyning. 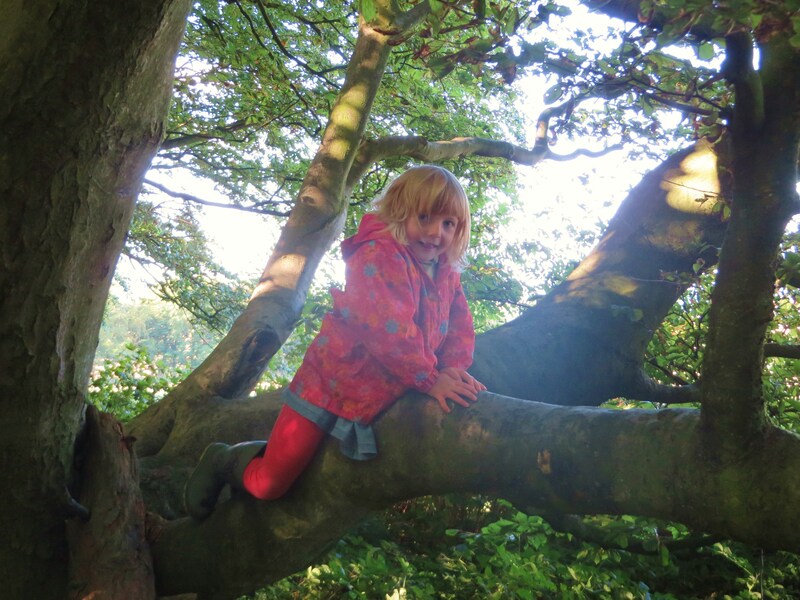 We didn't do any health and safety - the girls climbed low trees, medium high trees and very high trees. Quite a lot of people have asked me would I do it again. The answer: yes, but not with a breastfeeding baby in nappies. It’s hard work! Glad to hear you’re all OK. Was starting to think the worst. Are you ever going to write another book? Only so many times can re-read the last seven. The invitation to stay in New York is always there for you and family. And I have a few bikes you can even keep and take back to England. And a belated Happy New Year. P.S. I have a ticket in hand on ANA (All Nippon Airlines) for May 18th, 2015 for Japan,. and am taking my bike with me. Will be staying with Tomoko’s sister then riding around for my second time in Japan. Thank you John – though I have actually been here all the time! O wow! It was worth the wait. Thanks for the great update. Love the place names. Still trying to figure out but it seems that a Down is actually an up. You might live an antique lifestyle (comparatively speaking) but you and your family sure have one hell of a quality life. 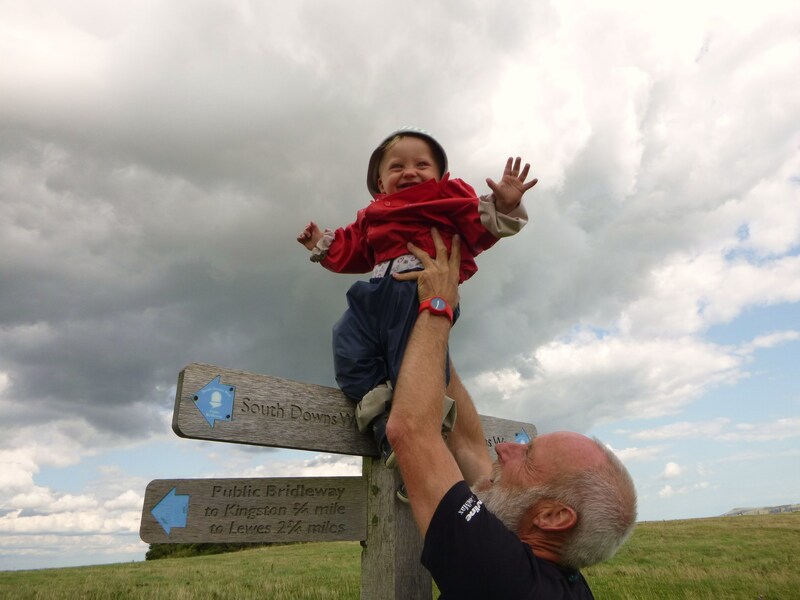 You’re right – Downs are big ups. Though you can go down a Down as well as up a Down. You can also go along a Down and round a Down and over a Down and through a Down. Glad to hear that you are all safe and well. What a wonderful adventure for you and your children and friends. Jack seems to have loved every minute of it and grown up such a lot. I think you deserve a medal. It must compare with training for the Royal Marines. All Good Wishes to you and your family and friends. Thanks Marie. 5 months on and I’m only just recovering now. But I’m sure I’ll drag offspring on something similar again soon. I am very relieved that you and the entourage made it, and I knew that eventually you’d back to let us know all about it. I can imagine the looks you all got from others as anybody doing something “different” is viewed as having “kangaroos loose in the top paddock” as we say here. The photos are great too. 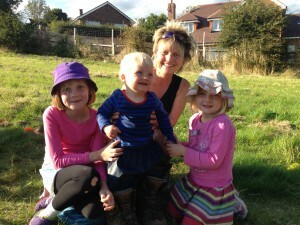 There’s no mistaking that the mob are yours: the 3 all look like you! Keep at Brit Telecom, they’ll give in eventually, though a personal visit to one of their offices in the UK might work. And don’t go on Facebook: boring in the extreme. I’ve been called a few things in my time but have never been referred to as having ‘kangaroos loose in the top paddock’. What a great Aussie expression. Molly likes it too! Added to my previous: I hope your parents are now well? Your Mum must be in at least her 80’s now. Treasure them while you can. Wow. What a trip. I too was wondering what had happened out there on the Downs. Obviously a huge success and just maybe sparked some trip ideas in the minds of some you met along the way. I have just finished your second book of cycling Japan – a great read and so different to here in Tasmania. 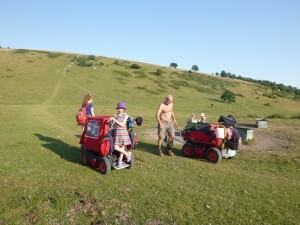 I can’t quite get my head around the large red sledgie things but they obviously worked ok.
Yes,Tony sledgie things worked a treat and are poised for the next ‘kangaroos loose in the top paddock’ mission. Kangaroos sound better than my relatives amongst the campanology. All I can say is amazing accomplishment. Congratulations. I am reading Slow Coast Home for about the fourth time and have been wondering what happened on your trek. Sorry to hear about ill parents. 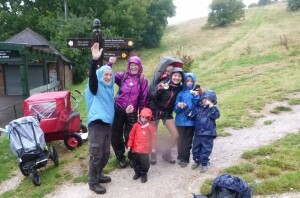 Very nice to see some pics and great to read this nice hike is tasting like more adventures on foot with your kids. I was really surprised with the amount of gear you took along. Oh dear that was much. 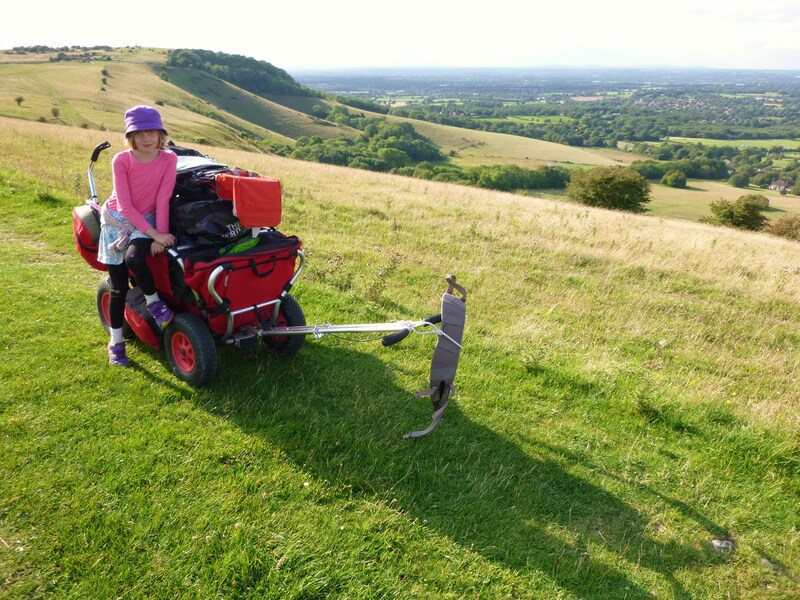 As an expert on these kind of hikes with small kids I know for sure you can do the same with less gear. Start with leaving at home everything you didn’t use at all. Next select the stuff you didn’t use often and ask yourself if you really did need it. Last look at the remaining gear and think if something can have more than 1 function replacing at the same time some other gear. When in doubt just ask me. I might have some refreshing ideas. The South Downs is now on my list to do to. How is it that you look the same as you did almost 20 years ago when I first came across your books?? Good for you: Fie on Twitter and Facebook! Yes, you look exactly the same as when I met you at the place in Manchester (the one that is a village which is just the same as moons ago). I have a photo of you taken with me. I can assure you I have changed whereas you have not. What a fantastic trip, are you going to follow Dervla Murphy’s example when they are older and take them all over the world??? Might prove logistically difficult. 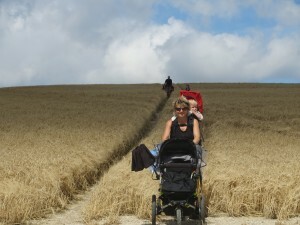 Thanks for these recent pictures, they are great and lovely reminders of the South Downs Way. 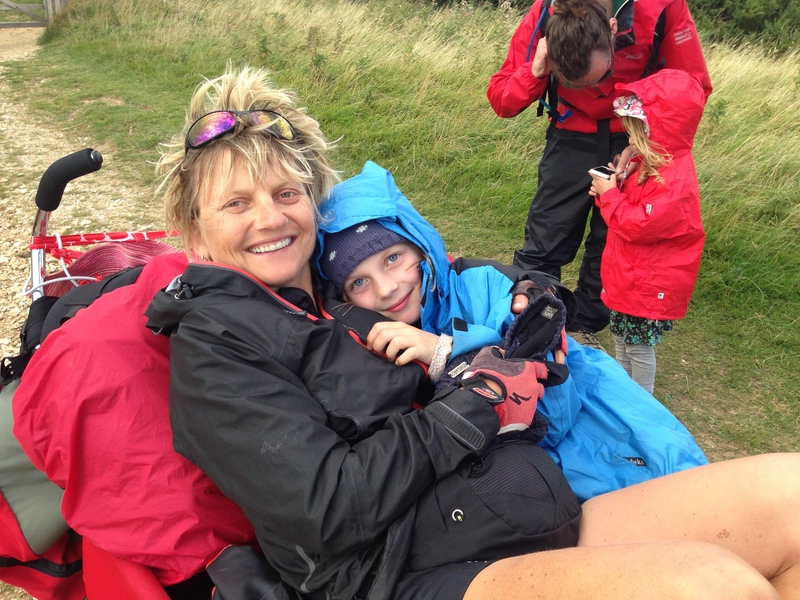 Wonderful to see you and especially the children having such a great adventure there. 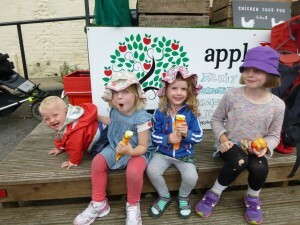 Hope you do loads more with them. Also thank you for keeping us informed and up to date with your stuff via this website rather than “social” media… Mind you another book would be nice! Thank you Josie. Thanks John le Poste and for all offers of back-garden camp spots and more. Another book is in the pipeline – am writing it, slowly, when I have a minute which tends to be in the middle of the night! So lovely to stumble across your blog! But I’m gutted that I never saw you on the Downs or knew about this before! 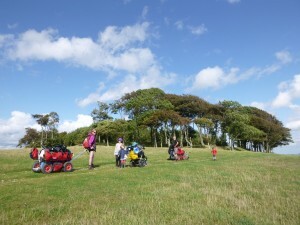 I now live in Brighton and we often walk around and on the Downs (usually out of season though because of my job-a photog) – I would have known exactly who you were if we’d have bumped into you! 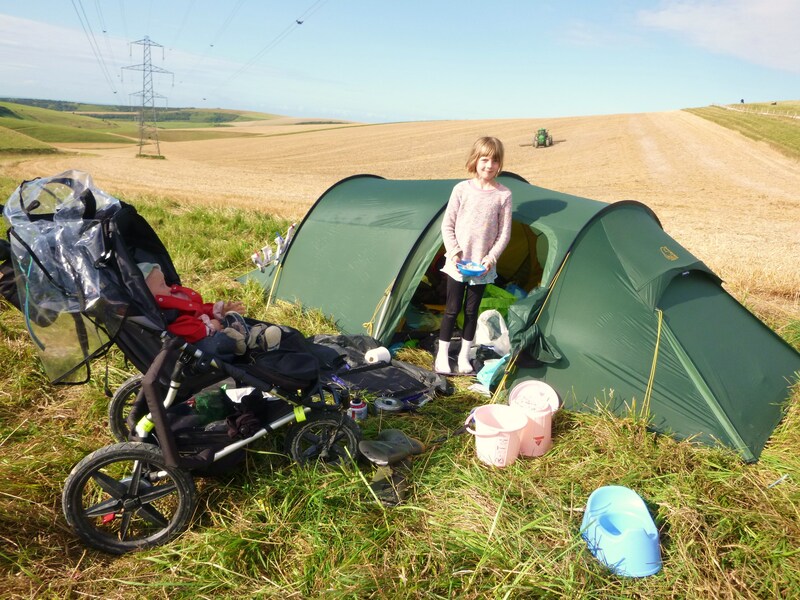 😉 Your books are my first ever travel reading as a teenager – I’m now 36 (boo) and love that you are now walking with your children! Don’t ever stop walking and writing! I must catch up with those past years ?.. Thank you for stumbling across me Sarah. 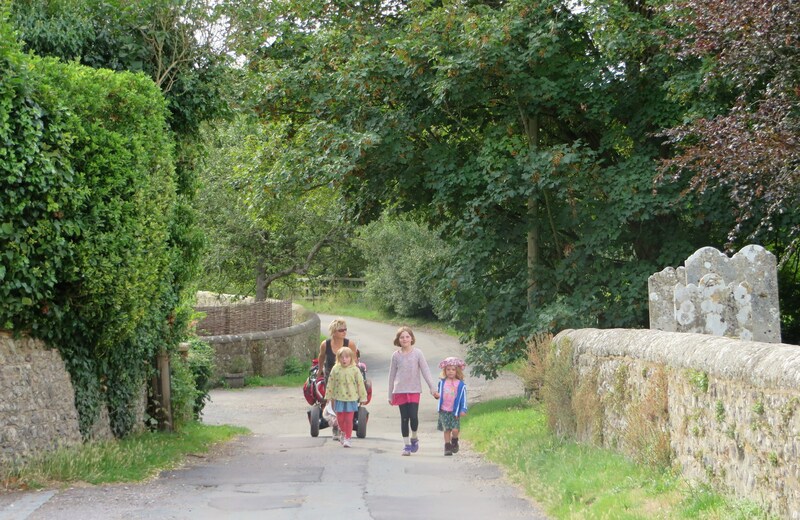 I’ll try not to stop walking and writing though it’s hard to fit it all in sometimes while looking after noisy herd of offspring! 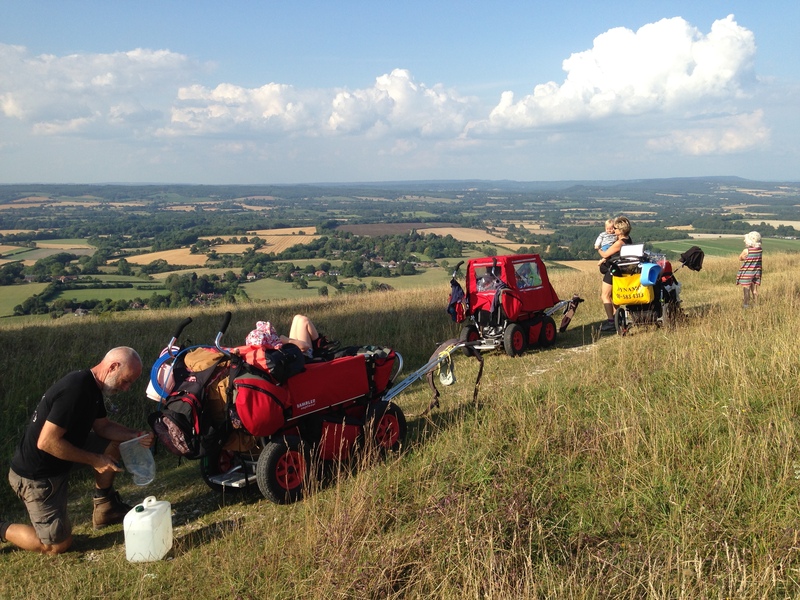 If you ever want to walk or ride the Ridgeway, you can add me to your “Offers of Places to Camp” list. Thanks Lizzie, the Ridgeway is on my list. Will try to remember to contact you when the time comes!